Also called bummalo, Bombay Duck is a marine lizardfish, Harpodon nehereus, from southern Asia, particularly abundant in the Ganges Delta and the Arabian Sea of western India. It's a narrow, usually 6 to 8 inches long, slimy fish. It is caught in November and December; the processing goes on from December until March. Under normal cooking conditions the fresh bummalo fish is almost rendered to a pulp (bones and all). It can also be dipped in batter and deep-fried. Bombay Duck is prepared in two ways. The whole fish are washed clean, split, boned, and dried in the sun. The drying is done on scaffolds made from bamboo poles fixed in the sand with bars tied with thick ropes horizontally in lines one above the other. This is the method adopted for the local market. For the British and Bangladesh markets the fish is filleted; ventral side is cut open, the heads, tails and fins are trimmed off. The skeleton is pulled out, the flesh flattened and cut into rectangular pieces. The pieces are immersed in 5% brine for a few minutes and dried on the scaffold in the sun for about 40 hours. They are then pressed individually in a roller press and further dried in the sun for about 10 hours. The dried pieces are bundled and packed in polythene sheets. 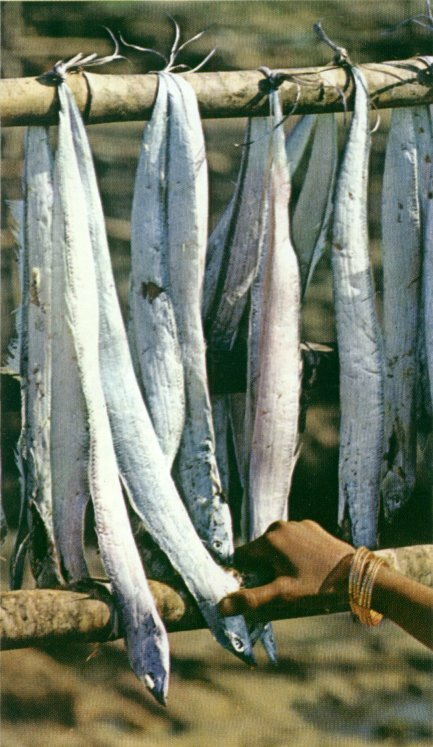 This method of preparation is a small proportion of total Bombay Duck production. Imports into the UK peaked in 1994/95 at 13 tonnes. The value of the export trade from India in 1994 was £42,000. Imports of Bombay Duck were subject to a mass of EC documentation, including a fumigation certificate, a phytosanitary certificate, a Chamber of Commerce certificate and an export agency certificate. There is a mystery about how this dried fish came by its name. Jamshed D. Mulla wrote to me saying, "I recently stumbled upon the derivation on the Internet and it is quite interesting. The name has nothing to do with ducks. During the British Raj, the Europeans could not stand the smell of the fish drying in the sun. It reminded them of the odor of the wooden railroad cars of the Bombay Mail train, which I am quite sure turned musty and pungent during the monsoon. The Hindi word for mail is "dak", hence the Bombay-Dak, or Bombay-Duck." An alternative explanation I have heard is that the Victorians were embarrassed to refer to bummalo fish because it sounded rude. They decided to make up a name similar to another dried fish called a "Digby Chick", dried herring.